This past weekend was our Spring Nature weekend at the White Oak Inn. We’ve been holding this particular weekend for as long as we’ve been innkeepers. A local naturalist takes our guests out in the woods for various activities including bird-watching, wildflower identification, owl-calling, artifact hunting and foraging for wild edibles. If we’re in luck (and this year we certainly were) they find a bounty of Morels, which are in season at this time of year, and we fry them up for everyone as an appetizer with dinner. I’ve seen plenty of recipes that include Morels, but my favorite way to eat them is simply dredged in seasoned flour and fried in butter until the exterior is crisp and the interior is creamy soft. Yum! So without further ado, here are some photographs and the instructions on how to prepare them. 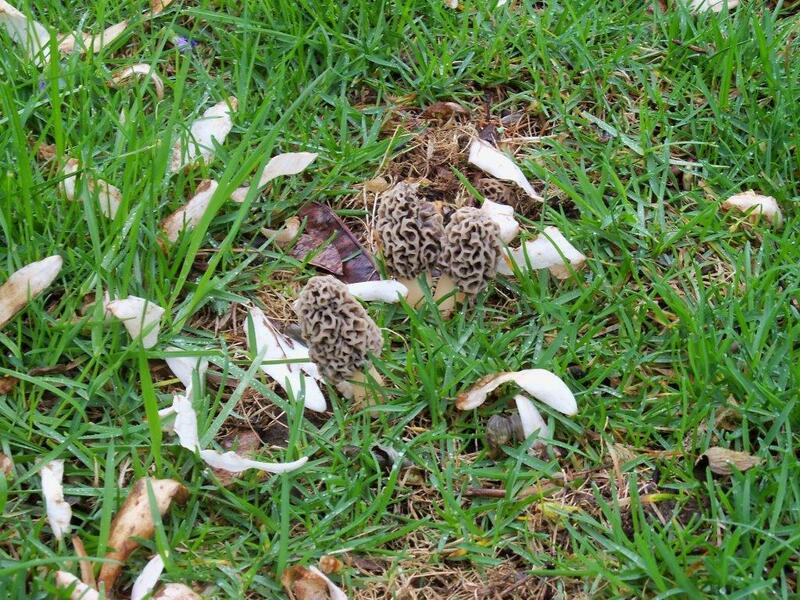 Morels hiding in the tall grass. 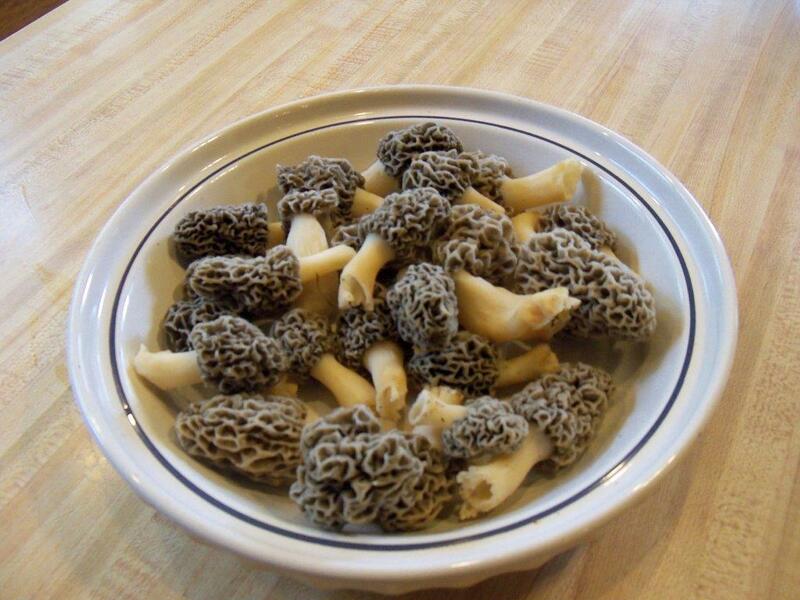 A dish of Morels ready to prepare. We always wash our mushrooms in salt water, both to remove any embedded dirt and to evict any “critters” living in them. We do this immediately before cooking – we don’t want the mushrooms to get soggy. However, opinions vary on this. Some people soak them overnight n the refrigerator. Some use salt and some don’t. And some say a simple rinse and brush with a damp paper towel or mushroom brush is sufficient. The quick salt water process has worked for us. Get a large enough bowl to hold your Morels. Fill the bowl with cold water and add about a teaspoon of salt for each quart of water. Trim off any dirty ends and cut your Morels in half lengthwise. Put into the bowl of salt water and let soak for about 5 minutes. Remove from salt water and rinse well. Lay them out on a kitchen towel or paper towels and pat dry. You want to get them as dry as possible. Now get your skillet medium hot and add a generous amount of butter – 2 to 3 tablespoons. Take a Ziploc bag and put in a cup of flour and 1/2 teaspoon each salt and pepper. Throw in a handful of Morels and toss to coat LIGHTLY with flour. Add to skillet. Repeat until all the Morels are in the skillet, adding butter as necessary. The trick here is to only add a few at a time to keep the skillet at a medium heat with a generous coating of butter. After 2 or 3 minutes, gently turn a couple of the mushrooms and look to see if they are getting golden brown and crispy. Cook until both sides are beautifully brown and crisp. Now this is where we should show you a gorgeous photography of the finished product. Unfortunately we were so busy enjoying them that we totally forgot to take the picture. This entry was posted in Soups Salads and Appetizers, Vegetables and Potatoes by admin. Bookmark the permalink.